I write and arrange hymns and sacred songs for brass quintet and other small instrumental ensembles. Feel free to look around. I want to provide you with high quality music arrangements and transcriptions that will make little impact on your budget. Having been a Minister of Music I know the challenges of finding good arrangements of music that can be played by church musicians and yet, stay within a tight budget. I hope to help you with this and honor God at the same time. If you don't see what you are looking for, send me an email and I will try to help you. Many of the arrangements here were made at the request of someone looking for something specific. My desire is to help you honor God through music by providing quality arrangements of hymns and other songs that are useful, versatile, fun to play, and affordable. How Will I Get My Music? You can download your music at anytime from each arrangement's page. You will receive an email with a password for your music after confirmation of payment through PayPal. .
10 Unaccompanied Hymns for Trumpet -- I've added 3 hymns to this collection but kept the price the same. Make a Joyful Noise (Psalm 100) for SATB choir with Piano by Tim Gray. This has been a dream of mine for a long time and I'm excited it is finally a reality. "Our Brass Quintet loves your arrangements of Be Thou My Vision and Christian Solders. We are looking forward to these new arrangements. Keep up the good work! 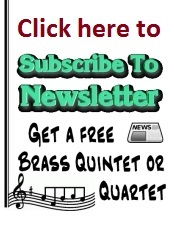 They are just right for an intermediate ability group of old brass players!" Inspired by Psalm 62 - "My soul finds rest in God alone." 14 flexible arrangements of hymns to use in contemporary praise and worship. Melody part, 2 harmony parts, obbligato melody part, and chords on one sheet with transpositions for most instruments. "I was very pleased with this arrangement! Arrange more hymns, please! "To be honest I based my buying decision on previous experience playing your arrangments. Your pricing is very reasonable so I feel my risk is pretty low. "We play all kinds of hymns. Secular music would also be fine. Our church offers both contemporary and traditional music depending on the worship service. In short, we are interested in all types of music - particularly intermediate well done arrangements like yours." "Having actually played some of your arrangements already - they simply fit our quintet. The price is very reasonable."